A camp on the Eureka waterfront. 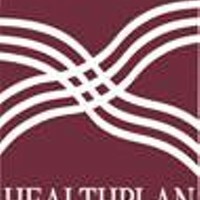 Following more than a month of meetings and deliberation by an ad hoc committee and intense public comment on the issue, the Humboldt County Board of Supervisors voted unanimously today to declare a shelter crisis and create a committee to explore housing trust funds and solutions to homelessness. 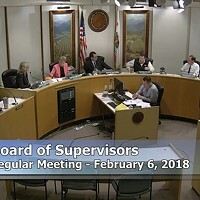 The decision, which came after over an hour of deliberation and public comment, was greeted with applause, although it's ultimate utility – as noted by First District Supervisor Rex Bohn – is unclear. "Eureka has had a declarations for two years and it hasn’t done much," Bohn said. "We can make all the declarations we want but we have to do something and work together." 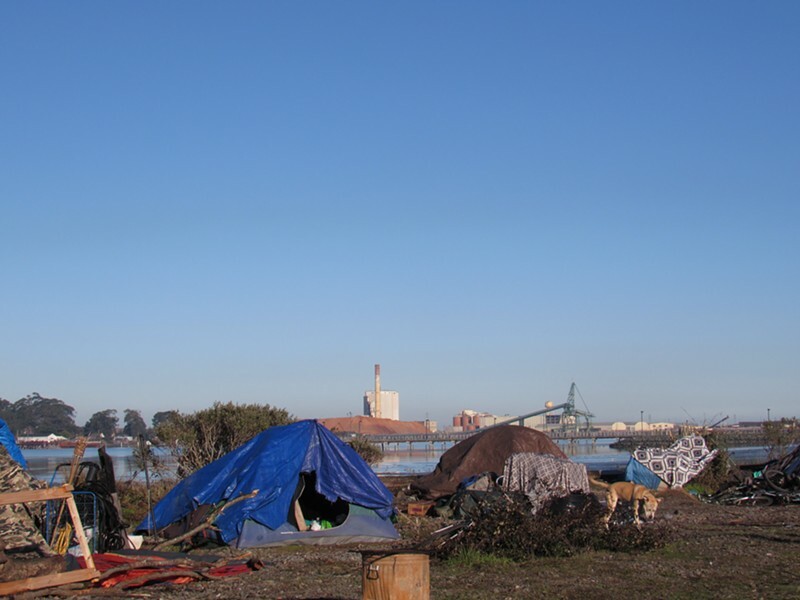 The Eureka Shelter Crisis – passed in a controversial 3-2 vote by the Eureka City Council in 2016 — did allow the city to relax some housing and building guidelines to create temporary camps and Betty Chinn's Blue Angel Village on city land. 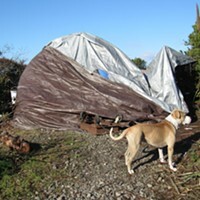 The county's resolution appears to include similar language, meaning that county land in unincorporated areas could be exempted from California Environmental Quality Act guidelines and other state statutes regarding housing to create temporary shelters. The declaration will be a tool for the yet-to-be-formed Housing Trust Fund and Homelessness Solutions Committee, which will consist of nine voting members appointed by the board, including a representative from the Humboldt Homeless and Housing Committee, a member of the Planning and Building Department and two at-large members who may include members of the homeless community. The committee will make recommendations to the board about potential shelter projects and the use of affordable housing funds for "brick and mortar" housing projects. Meetings will be open to the public. 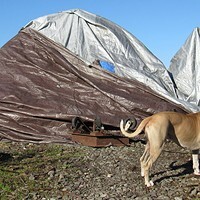 The shelter crisis will be reviewed after one year. Bohn said he saw its declaration as more of a "political football" than anything else, stressing as he has in the past that nonprofits, private citizens and religious institutions should be doing the heavy lifting. Fourth District Supervisor Virginia Bass said her district has probably the highest population of homeless people in the county and that renovation of existing motels and low income housing could be one solution. Many speakers during public comment cited the need for immediate, stabilizing shelter such as tiny house villages or tent cities. Second District Supervisor Estelle Fennell, who was on the ad hoc committee with Bohn, said the committee was "Humboldt County's answer to the issue." "By moving forward, all the passionate people will have a place to go," she said. But Third District Supervisor Mike Wilson, who originally brought the motion forward in January, said the declaration does not really address the root causes. "We live in a society that creates homelessness," he said. "Here we are again, bickering about how to create a strategy to use our meager resources."